The first skincare brand I ever tried as a teenager (other than Clinique pinched from my mum) was Simple. 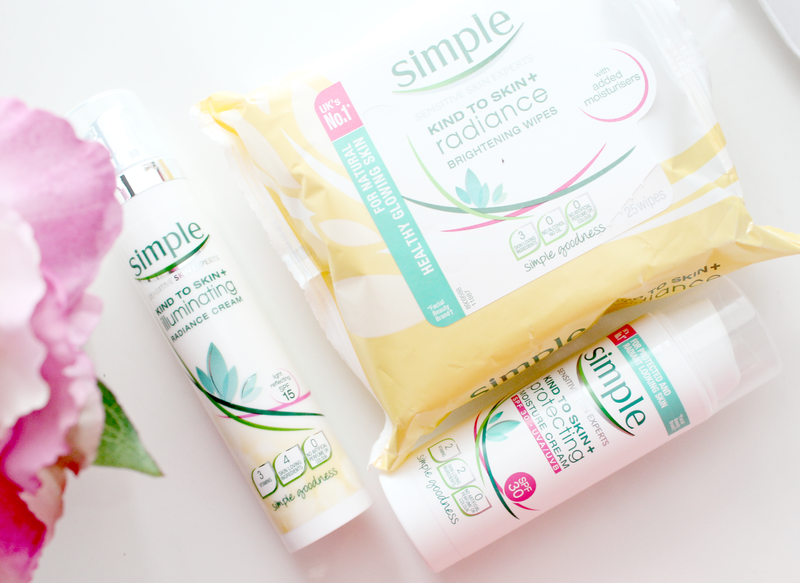 I'm pretty sure most young girls have tried Simple at some stage as it does its job well, is gentle enough to use on sensitive young skin and best of all, its as cheap as chips! I used to use their full cleanse, tone and moisturise system from the original 'Kind to Skin' range and it saw me well for a good few years until I became curious about other brands and started branching out into the world of high end skincare. 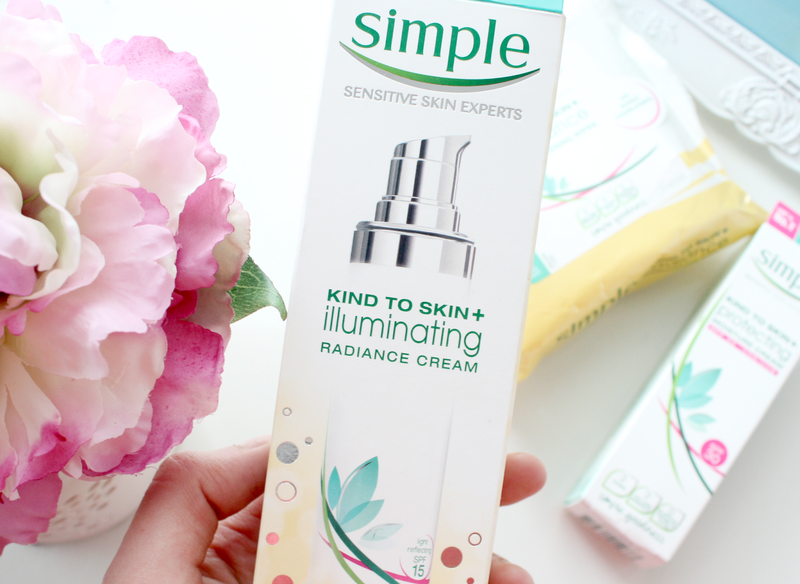 With this being said, I was very excited to receive some of Simple's new Kind to Skin + range to try out. The key part of the new range is the '+' part as Simple state that these products offer more than everyday skincare. "It’s a range of products with the same Simple goodness and skin loving ingredients as the trusted Kind To Skin range but with added benefits. We’re talking illuminating, protecting, brightening, perfecting and moisture boosting skincare treats." When I received these products in the post, this is the one I was instantly drawn to because of its 'illuminating' title. If you've been reading my blog for a while now you'll probably know how much I love the dewy skin look and any products that can help me get that much coveted healthy glow is a must have for me! Since giving this illuminating radiance cream a try, I've been really impressed. Its very lightweight on the skin so its perfect beneath makeup and the light reflecting particles provide a subtle glow without looking glittery or over the top. I've been applying it in a morning before my foundation and it just brightens up my whole complexion and makes my skin look more radiant. It also contains multi-vitamins and skin loving ingredients as well as SPF 15 which makes it all the more perfect for Summer. I think this is my favourite product from the three I've tried as it really does what it states on the bottle. Oh my gosh, a beauty blogger talking about face wipes and actually liking them? As you all know - face wipes get a serious bad rep in the blogging community and some have even gone as far as to say that anyone who uses them should be shunned. Wowza, strong words indeed! Anyway, I'm just going to put it out there and say - these Simple face wipes are bloomin lovely. Unlike traditional wipes that drag on the skin and don't feel particuarly moisturising, these ones are very effective as removing the top layer of makeup (much like a micellar water would) before a proper cleanse and they're really moisurising too. My skin always feels silky smooth and hydrated after I've used these wipes and they've come in really handy on those days when I'm in a rush and can't be bothered using a million cotton pads to remove my makeup! I'm also planning on taking these on holiday as they'll be great to freshen up with throughout the day! Much like the illuminating cream, this protecting moisture cream is great for day to day use as its so lightweight and perfect worn underneath makeup. If you have dry skin you might not find it heavy enough to provide you with the moisture you need but for a combo skin gal like myself, this is all I need to prep my skin for makeup and keep it hydrated throughout the day. I also love that it has a SPF 30 as it will keep my protected right through the Summer months. Not much else to say on this other than its a great little moisturiser and as with all these Simple products, its perfect for even the most sensitive of skins. A bargain at only £3.99 too!! Overall, an impressive trio from Simple! I'm loving their new and improved packaging and the products do what they promise. I'd highly recommend this range if you're young and just getting into skincare, if you're on a budget or if you have sensitive skin! Priced at less than £20 for all three - its a fabulous skincare bargain!Do you like the look of this new range from Simple? great post, I am going shopping for a SPF moisturiser tomorrow so it's good to know that this one is only £3.99, bargain! I like the purifying creamy cleanser, it's only £2.99 too! I swear by Simple and have used them for years. I went and tried different brands but nothing seemed to help my skin as much as Simple. I recently reviewed their Perfecting BB cream that I bought which is amazing. 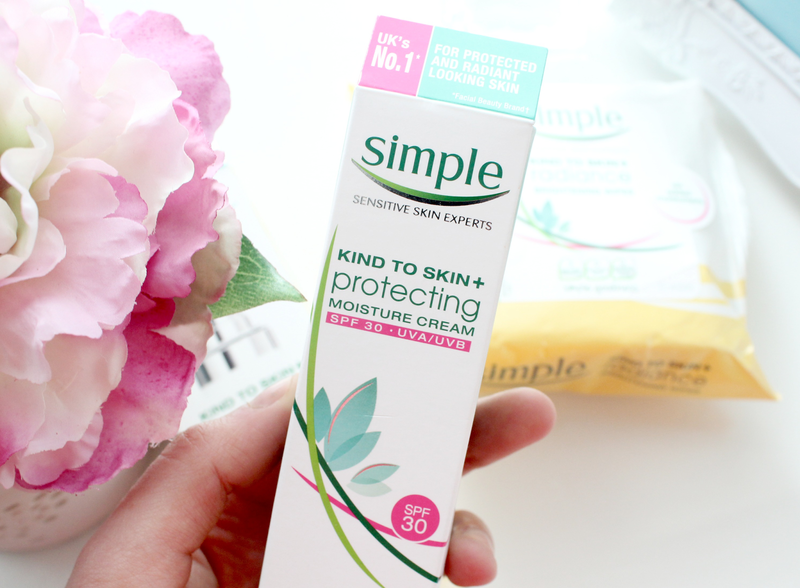 I love Simple brand and swear by their 'Spotless Skin' moisturiser! It's amazing! I always tend to buy the Simple facial and body sun screen too so the new moisturiser with the SPF sounds perfect! It's a long time since I last used Simple, but I have good memories. You might have tempted me back! I love their facial wipes. Fantastic at removing all the make up. Hello, my name is Savannah and I am a French blogger. I love Simple as a brand in general, I really do love the simplicity of the brand! Definitely going to have to try the Illuminating Cream - although by the sounds of it, I may have to be a bit wary of breakouts! Their Light Cleanser and Toner have been my staples for a couple of years now and I cannot fault them! 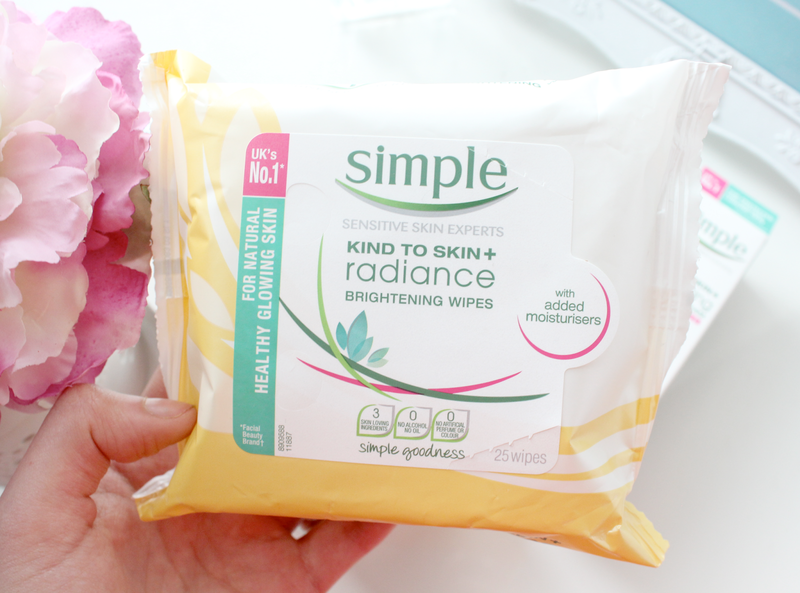 I do love Simple skincare, I always have a pack of their wipes in my draw for emergencies. They are such a underrated brand though! Genuinely never tried simple!! Will have to though.